The National Centre for Research and Development (NCBR) has just granted over 31 million PLN to General Electric Company Polska Sp. z o.o. (one of the parties together with the Institute of Aviation creating Engineering Design Center) for the new compressor development which later on will be used in a new turboprop engine. The total amount of money needed to design and test this component is estimated to be more than 53 mln PLN. With the government grant, our engineers are going to create a world class technology compressor that later on will be fitted into the new turboprop centerline. 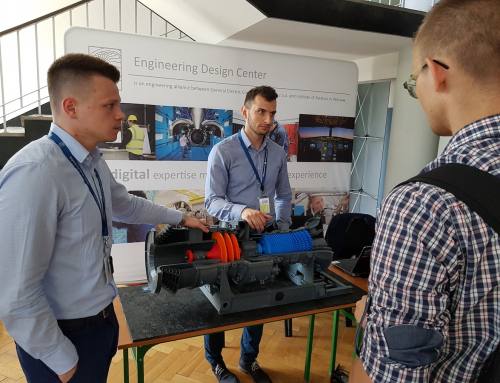 The engine that is currently being co-designed in Poland will be used for a variety of single engine applications for business and general aviation. The innovative technology and engineering skills of Polish engineers are going to create a very competitive compressor that will transform into engine performance. This design will enable the engine to have better fuel consumption than current designs available on the market. Moreover, the compressor will have much higher compression ratio than the competition. “In the process of design our engineers will use their experience gained during the realization of projects concerning large commercial aircraft engines like CFM, GE90 or GEnx.” – says Konrad Socha, the manager of the team responsible for the design. – “We have set a very ambitious goal. We are willing to to put the product on the market no later than 4 years from now.” – he adds. “I am really proud to work on this engine component. I know that this will put us engineers on a stretch, but this is what we are looking for: to develop, design and test parts that we have designed and see it working as intended. It is the best you could get out of being an aerospace engineer.” – says Piotr, one of EDC engineers responsible for the compressor airfoils design. What is worth emphasizing is that the Polish facility has the ambitions to take over the full responsibility for the project within the global team. Poland will be the place where all decisions regarding module architecture, structure solutions and used technologies will be made.